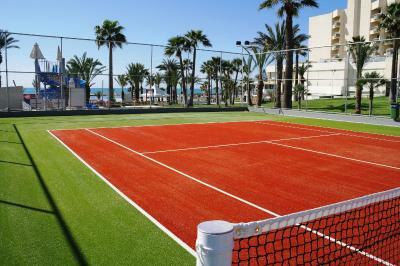 Lock in a great price for Golden Bay Beach Hotel – rated 8.2 by recent guests! Reception staff: amazing. Property well maintain and clean. Good breakfast with a nice view from the yacht club. 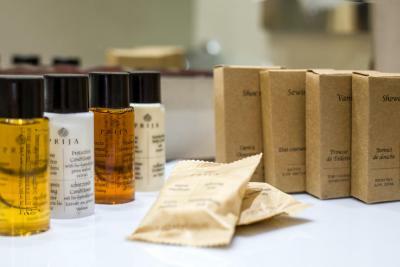 The room and the brand new bathroom were very spacious with every detail sorted from full toiletries, loads of fluffy towels, espresso machine and as many pillows as we could ask for. The terrace was superb and the balcony Jacuzzi was clean and hot. 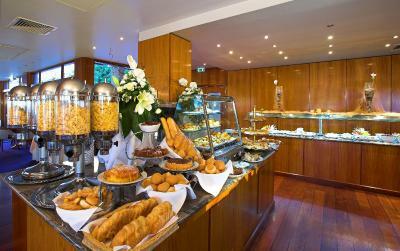 Reception staff were helpful and friendly and the breakfast was a treat. 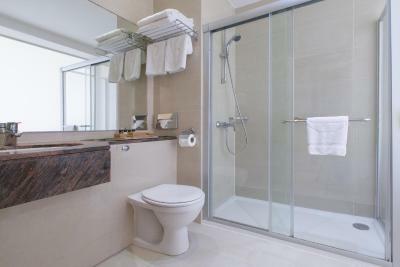 Food excellent, everything very clean, like the glass wall between the room and bathroom, very good solution. Good room size and good breakfast. Staff tried to be helpful after we convinced them that we wanted the hot tub, hot, not cold. Parking and access OK.
hotel staff were extremely helpful and friendly. Breakfast buffet was great and everybody liked it. We got the rooms as early as they were ready, hours before official check in time. Staff very friendly and helpful. I forgot my watch there and it was found by room service. Golden Bay Beach Hotel This rating is a reflection of how the property compares to the industry standard when it comes to price, facilities and services available. It's based on a self-evaluation by the property. Use this rating to help choose your stay! 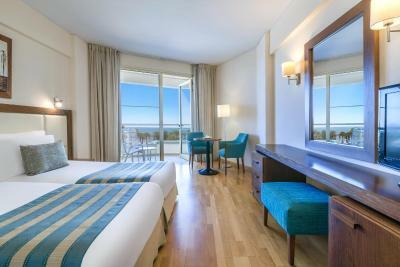 In Cyprus near Larnaca Bay, the Golden Bay Beach Hotel is 300 feet from the beach. It features a large outdoor pool with a furnished terrace and on-site private parking. Free Wi-Fi is available in all areas of the hotel. 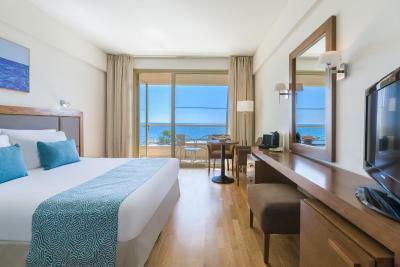 Golden Bay provides spacious rooms and suites with balconies and views of the Mediterranean Sea. 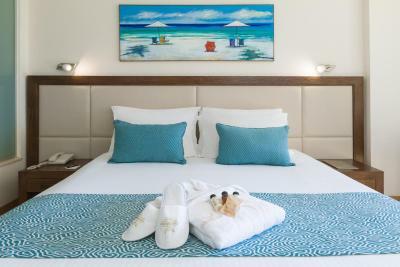 Each room has air conditioning and is equipped with satellite TV and a minibar. 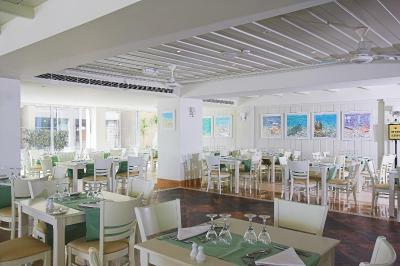 The Golden Bay Beach Hotel provides several dining options. Guests can swim up to the pool bar to order a refreshing drink, or visit the English pub. The hotel is surrounded by landscaped grounds. 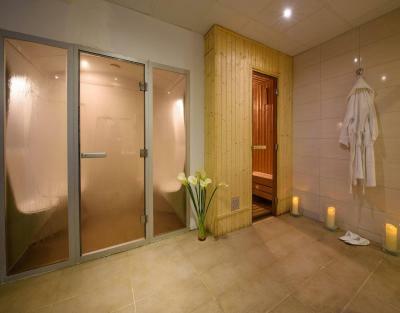 Guests can enjoy a relaxing massage or beauty treatment at the spa. 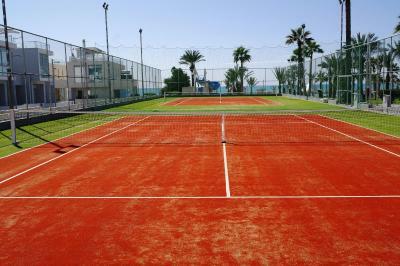 Hotel Golden Bay also has a game room, a playground and provides childcare services. 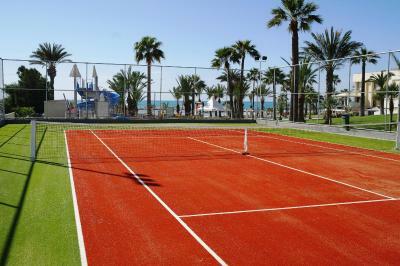 Larnaca International Airport is 8 miles from the Golden Bay Hotel. 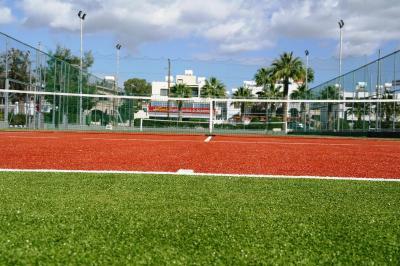 The center of Larnaca is a 15-minute drive away. 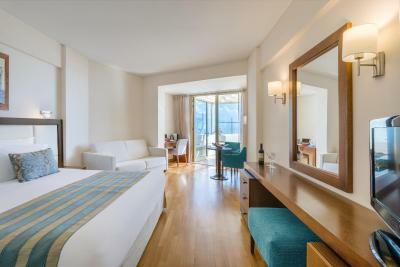 When would you like to stay at Golden Bay Beach Hotel? 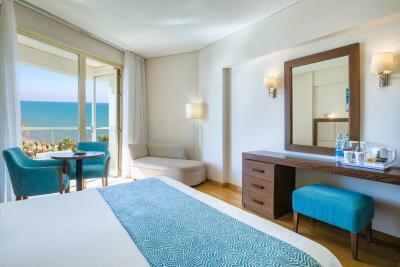 These rooms feature direct views of the pools and the seafront. 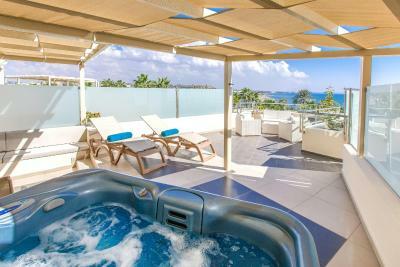 This suite features a private terrace with a shared hot tub. Free Wi-Fi is provided. Please note that guests receive complimentary house wine and fruit upon arrival. 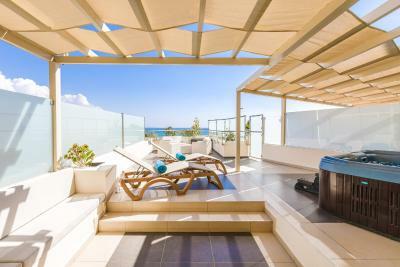 This room features a private balcony with views of Mediterranean Sea. It includes a spa tub and free Wi-Fi. Please note that guests receive complimentary champagne and fruit upon arrival. On the second floor, this suite has an entrance paved with luxurious Italian white marble. The large windows and patio door lead out to a private patio with a private hot tub. This room features a private terrace with a shared hot tub. Free Wi-Fi is provided. This unit can accommodate up to 2 adults and 2 children up to 12 years old. 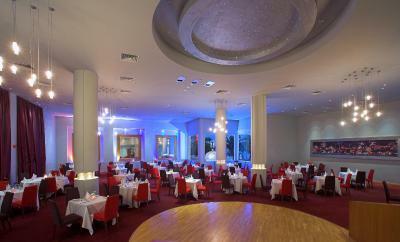 A prestigious five-star Hotel in Larnaka, situated directly along the sandy beach. 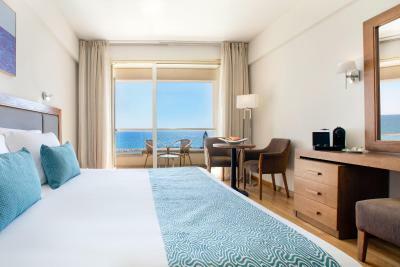 With an open view of the outstanding Mediterranean and beautiful surroundings, it offers the ideal destination for those looking for a tranquil and worry-free Holiday, under the warm Cyprus sun. 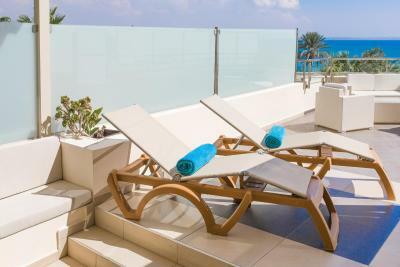 Whether travelling on Business or Leisure, our selection of spacious sea view rooms, luxurious Mini Suites complete with a private terrace and open-air Jacuzzi, along with our six lavish Grand Suites portraying a panoramic sea view, will ensure you a comfortable and enjoyable accommodation. 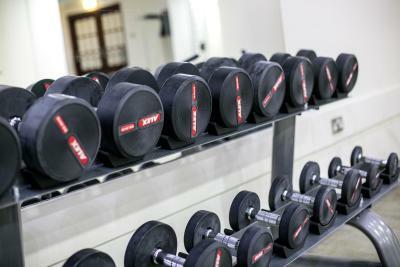 Highlight your stay, by making your reservation at our newly renovated Spa Salon, where Health and Beauty are adjoined with a collection of fitness, relaxation and rejuvenating beauty treatments. 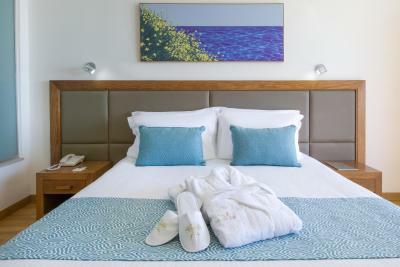 House Rules Golden Bay Beach Hotel takes special requests – add in the next step! Golden Bay Beach Hotel accepts these cards and reserves the right to temporarily hold an amount prior to arrival. Kindly note that baby cots/cribs can be provided upon request. 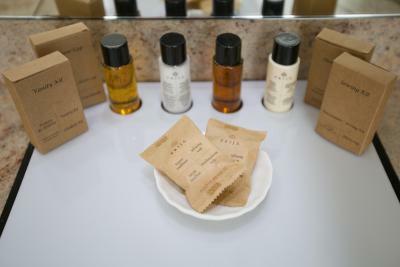 Guests are kindly requested to have the credit card used to make the reservation upon check-in. The staff in general was really friendly. The room was clean. The service at the lobby bar was really nice. The food was excellent even if the food was not really matching the theme announced. This is not a 5 star hotel. 3 star at best. Bed very uncomfortable and pool area smells. Room was not properly cleaned when we checked. Breakfast was nice and there was a good selection. The indoor pool room surroundings need renovation, especially for the top - it looks dirty (however, the water was clean). Although the hotel definitely needs some renovation and internal parts repair in multiple places, the overall atmosphere was really nice, rooms are quite clean and the staff is very friendly and helpful. The breakfast was really great. Location is really nice, right to bus stop and number of stores so you can easily both get to the city or buy the needed things nearby. The upgrade and the stuff. We had jacuzzi in the room, wine and fruits. We loved everything. The room was excellent, and the view from our balcony was fantastic !! The mattress! The worst mattress, I couldn’t sleep all night! I would never stay in this hotel for this reason only! Facilities are little bit outdated. 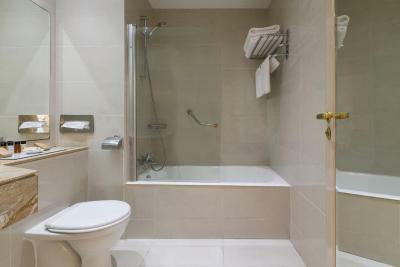 Bath is too narrow to stand in for a shower without nearly overbalancing. Eggs at breakfast always cold. Television has little in the way of sport and is mainly geared to German and Russian guests. Good hotel with pleasant staff.